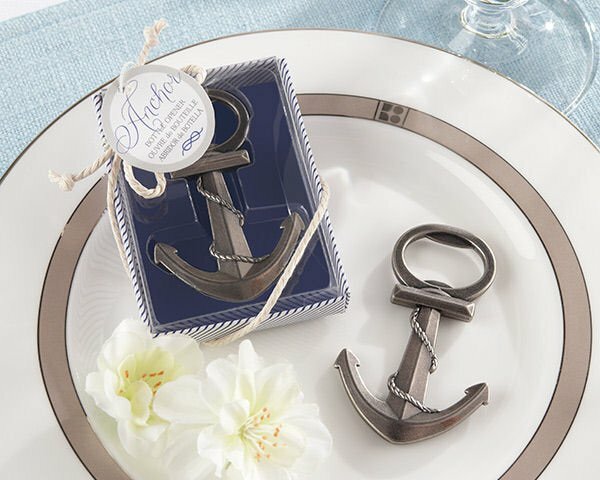 Don't let the ship sail without our practical nautical theme wedding favor that is sure to be hit at any aquatic event. Whether your event is an anniversary, wedding or up north family reunion our nautical themed bottle opener will be a necessity for opening a cold favorite beverage and enjoying it with family and friends. Each pewter-finish metal anchor opener has a lovely rope detail and measure approximately 2 3/4" x 1 1/2". Our impressive presentation arrives in a blue and white striped box with a clear display cover and is tied with a white rope and embellished nicely with a round coordinated hang tag making this a perfect gift on the go. Personalized tags are also available and arrive unattached. Assembly is required. If I do not select the personalization option on the anchor bottle openers, do they still come with a tag and string? Yes, the Anchor Nautical Theme Wedding Favor Bottle Openers will still arrive in a blue and white striped box with a clear display cover. They are tied with a white rope and embellished nicely with a round coordinated hang tag, making them a perfect gift on the go. I was looking into the anchor bottle openers I see there’s two options one that is brass finished and one that is pewter finished. Which one is more durable and stronger? I don’t want it to break on the first bottle. I also don’t understand the weight difference. Yes, the 'Antique Brass Anchor Design Metal Bottle Opener Favors' are larger than the 'Anchor Nautical Theme Wedding Favor Bottle Openers.' They're from 2 different suppliers, but we have not received any quality complaints for either item. They're both metal, you can chose from either Pewter finish or brass finish for both metal openers. They are of similar quality. The main difference is the color, size and packaging. I recommend ordering 1 Favor (Sample) of each to determine which one will work for your needs.